I don’t think there is anyone out there who doesn’t understand that eating healthy is an important part of their overall health. The problem is that well-meaning fitness & nutrition professionals make this task overwhelming for people when they are just starting out. Below I have shared 3 awesome infographics that will help guide you to making healthier eating choices.. But before we get to that, let’s discuss 3 major pitfalls to avoid. 1. Taking on too much all at once. Have you ever heard of the “honeymoon” period? Ya know, that time when you are so enamored by your loved one that you find everything they do to be charming? Well if you have been with your spouse for more than 2 years, you have realized that this wears off and your true compatibility as a couple will be tested. The same is true for any diet or healthy lifestyle change. The first few days or weeks may be easy, but true change takes commitment. For this reason you should change your habits one at a time, making sure you are consistent for at least 2 weeks before moving on to the next habit. 2. Making it too complicated. While I have no problem with someone being 100% vegan or drinking only fresh juice for days on end, these lifestyles represent an extreme for most of us. Rules can be helpful as they can provide clarification, but if you find that a diet trend is forcing you to give up something you enjoy (like backyard Barbecues or cocktail hour) chances are it will not last. Instead, choice to only focus on fixing the “big things” that are having a negative impact on your health first, like eating fast food not drinking enough water before you try a fancy diet trend. 3. Going it alone. Social support is the most overlook aspect of making a healthy lifestyle change. It’s nice if you family or coworkers are wanting to start a program with you, but you still need to look for outside support as well to keep you on track you when neither of you are motivated anymore. This can be in the form of going to a class at a gym, hiring a trainer or even an online coach. The point here is to have someone that will hold you accountable to your healthy eating habits. 1. Prioritize whole foods. The most important thing to know when you are choosing something to eat is to understand that food provides essential nutrients for our body. Without eating whole, real, foods, our bodies will be deficient. In fact according to Dr. Mark Hyman, 92% of Americans are deficient in 1 or more nutrients which makes food choice & supplementation a wise choice for all of us. This infographic will show you some of the natural sources of the vitamins and minerals are are so important to our well being. 2. Stop what you are doing and eat a real meal, not a snack. Now, while it’s great to know what foods contain what nutrients, unless you know how to structure our meals too- the information is useless. The infographic below will show you what your plate should look like for at least 2 (if not all 3) of your main meals throughout the day. According to the Center for Disease Control’s nutrition report for 2013, most Americans get less than 2 (1.3 to be exact) servings of vegetables per day, so if you can get 2 of your meals to look that the plate pictured below (with about 2-3 servings of vegetables), you will be well on your way to a healthy diet. 3. 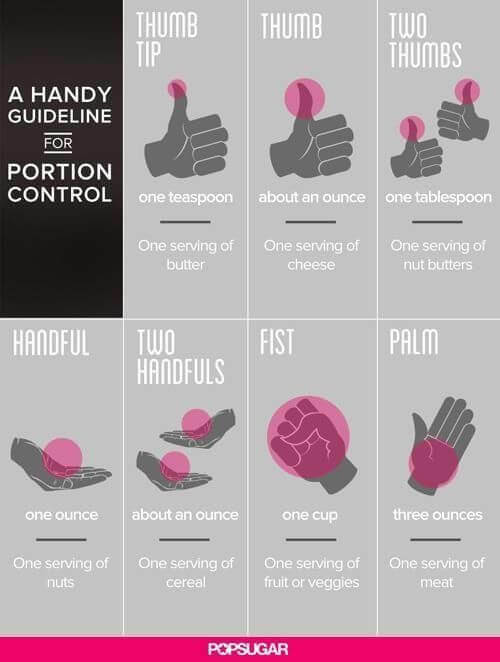 Monitor your portion sizes at every meal. Most of us understand that our portion sizes have gotten bigger in the US over the past few decades, but according to the National Institute of Health, restaurant portions have doubled or tripled, which means we have to actively monitor our portion sizes to stay healthy and avoid gaining weight. The infogrpahic below gives easy tips on how to do that whether your at home in your kitchen, or eating at a restaurant.